Mermaids are huge right now. Yesterday, I wrote a short story about a siren. Today, I'm going to a Mermaid Museum to promote Freeform's upcoming Siren series. K.M. 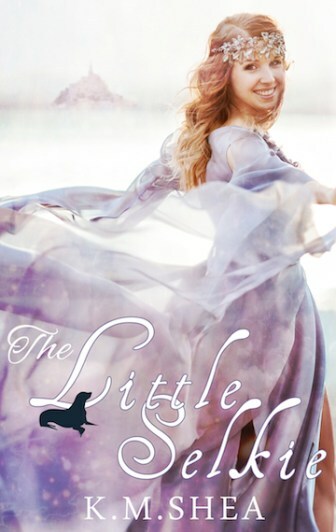 Shea, the author of Cinderella and the Colonel from the Timeless Tales series and A Goose Girl from the Entwined Tales series, decided to take the story of "The Little Mermaid" in a new direction with her fifth Timeless Tales novel The Little Selkie. Unlike the Entwined Tales version of the story, A Little Mermaid by Aya Ling, The Little Selkie reimagines the little mermaid and her family as selkies, beings from Celtic mythology who have the ability to transform into seals by putting on seal pelts and taking them off to become human. This obscure mythology was featured in the 2014 animated movie, Song of the Sea. Dylan is not like other selkies. Instead of a seal skin, she was born with the pelt of a sea lion. In Dylan's world, sea lions are less respected among selkies, but she compensates for it by being a daughter of the selkie king and queen and by having the most powerful singing voice among her sisters. The song of the selkies holds a great deal of magic, allowing them to control the ocean. Dylan is coveted for her powerful singing voice. When she is kidnapped by the wicked Sea Witch who steals her pelt, she begs an enchantress to seal her voice away to ensure her safety from the witch's goons until her pelt is recovered. Dylan's insufferable pride is her greatest weakness, but it also makes her very interesting as a character. She refuses to ask anyone for help or even tell her family she was kidnapped. When she becomes the unwilling ward of one of the Sea Witch's goons, Dylan is given refuge at a castle where a prince she had rescued before her voice was sealed resides. I enjoyed this book significantly more than Cinderella and the Colonel. It was less political and did not drag as much. The magic and mythology of the selkies kept the story interesting, and Dylan's romance with Prince Callan felt much more organic. They both eventually recognized each other from their initial meeting, eliminating the mistaken identity plot from the fairy tale. I loved reading about how Dylan gradually acclimated to human life in spite of her preference for her sea lion body. Prince Callan presented her some of the most beautiful gowns during her stay with him, considerately taking into account her preferences toward sea glass instead of expensive jewels and flowing fabrics that resemble the waves of the ocean. Like in A Little Mermaid, Dylan was able to communicate with the other humans through writing even though her was voice sealed. She was given a slate and chalk to use for conversations with those around her, particularly Callan. Despite Callan's curiousity, she was very careful in how much she revealed to him because she feared that her pelt would be destroyed by Jarlath if she gave too much away. If that were to happen, she could never become a sea lion again. When it comes to mermaid stories, I usually enjoy reading about imaginative cultures and underwater worlds. The Little Selkie did not have any of that since seals and sea lions spend more time on the surface than they do in the water. Though that was a little disappointing, it still did not divert from my interest in the story. The Sea Witch made for a formidable villain even though Dylan's biggest obstacle for most of the story was Jarlath, an incompetent goon who held her hostage at the castle. Overall, A Little Selkie was an enjoyable alternative to "The Little Mermaid" with a daring and clever heroine. I enjoyed the use of selkie mythology would recommend it to anyone who likes reading fairy tale retellings. It is the fifth book in K.M. Shea's Timeless Tales series. For more retellings of "The Little Mermaid," check out Of Land and Sea: The Untold Story of the Little Mermaid, the book I wrote in 2009, as well as A Little Mermaid by Aya Ling.